This Big Idea is sweeping public and private institutional investment funds globally in the belief that it is overdue to begin more demonstrative action against human caused climate change. Canadians have a particularly important role to play in this. Current government policy has focused the economy on fossil fuels, at the expense of a broader based economy, and is now experiencing the wrath of the “natural resource curse. Canadian innovation and productivity have plummeted on the OECD scale, and Canada is entering a highly volatile and uncertain recessionary period, as forecast by The Conference Board of Canada, the International Monetary Fund, and numerous Canadian banks. Faculty at the University of British Columbia have voted in favour of the institution divesting its existing fossil fuel holdings and forgoing further investments in companies connected with fossil fuels. The results of the referendum were released Tuesday, with 62 per cent of voters supporting divestment. Of UBC’s $1.2-billion endowment fund, more than $100 million is invested in oil, natural gas and coal. The faculty vote is calling on the university to divest completely from those holdings within five years. “Just as UBC has pledged to use its campus as a ‘living laboratory’ for sustainability, we call on our university to apply its expertise with the same vigour to the endowment,” said Kathryn Harrison, professor of political science and a climate policy expert. The faculty will now put their proposal to the university’s board of governors. 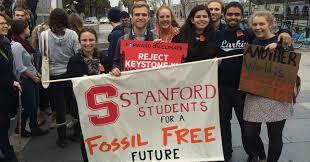 The fossil fuel divestment movement started in the United States and has spread across North America and Canada. Last year, UBC students held their own referendum on the issue, with an almost four-to-one vote in favour of divestment. Today’s vote comes just before Global Divestment Day on Friday when, the UBC campaigners say, a divestment campaign will be launched at the University of Calgary.